“The Young and the Restless spoilers” for Friday, February 3rd, tease an episode when three Genoa City tales take unforeseen twists. Read on for more details! Finally, Phyllis (Gina Tognoni) has been moving on from Jack and Jabot. She has been attempting a fresh start in many ways. Tomorrow her efforts backfire. We all know better than to think she’s down for the count though. Gloria (Judith Chapman) wanted to get in on the Fenmore’s takedown action but got left in the cold. Then she convinced Jack (Peter Bergman) to get drunk and bedded him in her post-Fenmore’s-takeover despair. That wasn’t enough for this plucky Genoa City heroine. Thursday, she steels herself for a continued effort to avenge herself. From someone willing to be so underhanded in relation to her daughter-in-law, that’s kind of scary. Then again, Lauren (Tracy Bregman) can clearly take care of herself. Billy (Jason Thompson) and Victoria (Amelia Heinle) have been acting like something would happen between them lately. As Billy helps the stressed-out Victoria with Reed (Tristan Lake Leabu), Victoria has seemed at once annoyed and also like she’s once again appreciating the good things about her ex. Tomorrow they get intimate. 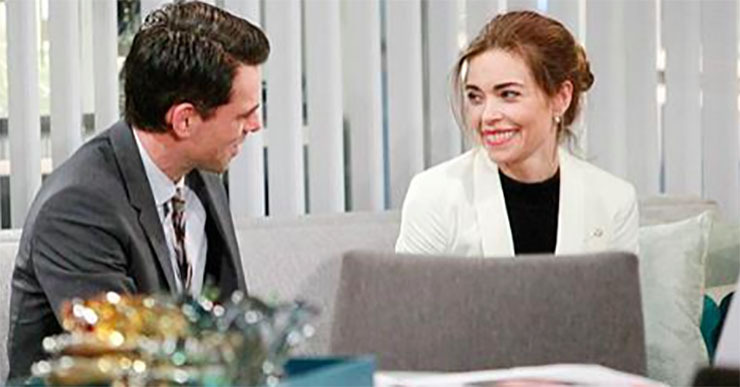 Head writer Sally Sussman has hinted at her affection for this pair, and there are a lot of Villy fans out there too. So we’ll be interested to see where this goes! Gloria what have you done!! Going on GC. BUZZ Wait until Jack gets a hole of you!!! They sure right now has A great friend ship but will there be more it’s hard to say ..